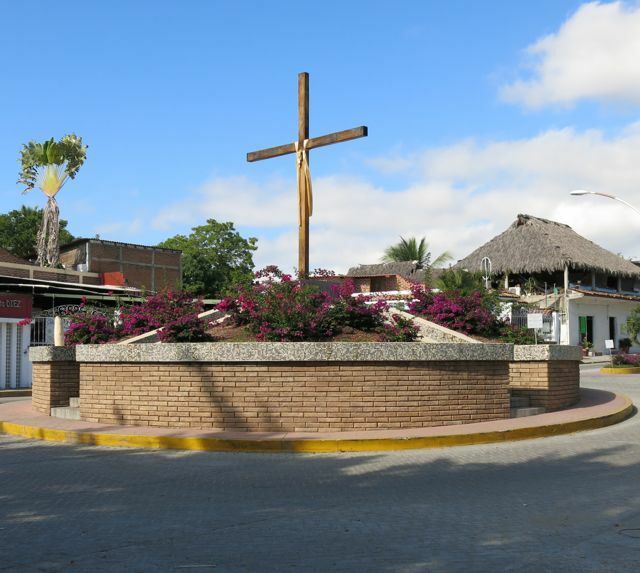 There's just something about the little town of La Cruz de Huanacaxtle. Our first glimpse of this authentic Mexican fishing village was by sea from the deck of our sailboat "Pacific Jade" in 2005, but yours is likely to begin at the single set of traffic lights on the highway. 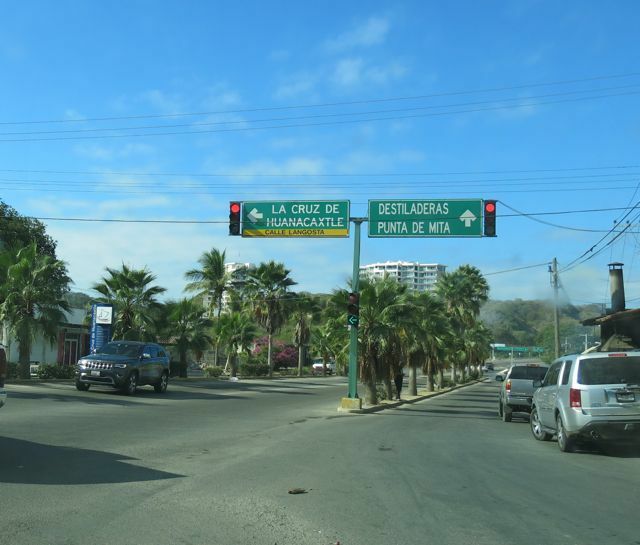 Dividing the town into the more residential, sleepy area up the hillside and the lively waterside section, the highway runs parallel to the water and provides easy access all the way around Banderas Bay. The traffic lights are an important hub where busses stop to drop off and pick up passengers headed either North toward Punta de Mita or South to Puerto Vallarta. There's always a taxi or two waiting on either side of the highway and this is also the corner on which our favorite rotisserie chicken place resides. I remember sitting at that chicken place a few years back waiting for our order to be ready. The lone plastic table we occupied was set with an assortment of hot sauces and serviettes. Three little kids from down the block came tumbling over, the little girl wasn't 3 yet and her brothers were probably between 4 and 6. They politely excused themselves as they reached across the table for the hot sauce. The oldest of them carefully poured it on his brother's candy sucker and his own. The wee girl held hers out flat for the same treatment and they happily tumbled back down the road. That small town ambience has endured in this little pueblo even though it's just a short bus or taxi ride from the bustle of Puerto Vallarta and a mere stone's throw from Bucerias. Not to mention how it's handled the appearance of the 340 slip Marina Riviera Nayarit without losing it's charm. Photo courtesy of MJ Makepeace. Glorieta and the cross of huanacaxtle wood. Turning left here will take you to Mario's tienda - a small, tidy and well stocked corner store that marks a couple of blocks where you can get anything from fresh fruits, vegetables and tortillas to beer and dry goods. At night, music floats over the cobblestones and the sizzle of "Tacos in the Street" entice you to take a seat. "Let's Rock Country" (formerly "Philo's) resides in the midst while "Ana Bananas", all the way at the bottom of the street, hosts open mikes and local jams and offers a quiet respite in the shade to sip a margarita. But, I've gotten off track ... let's get back to the glorieta. 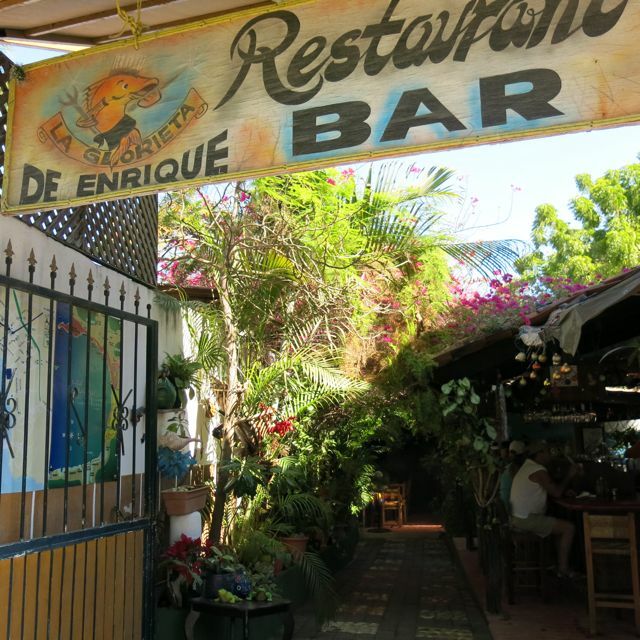 Enrique's is a shady oasis a few steps further down the hill where we like to stop for a hearty home cooked breakfast. 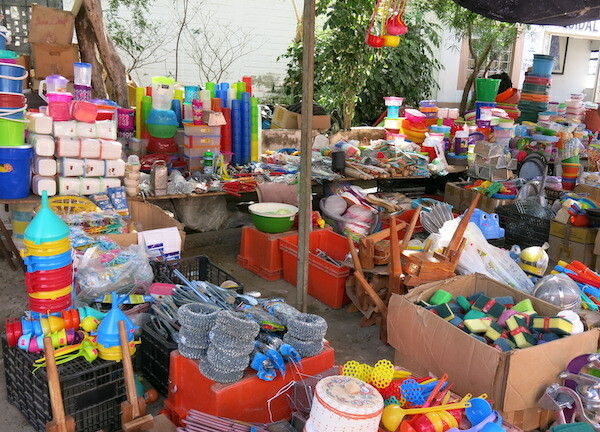 If you keep going down the hill (toward the marina) for another block, and it happens to be Wednesday, you may encounter the regular weekly street market. And over here we have oranges, apples and bananas. This is where we usually go looking for household items and fresh fruits and veggies. 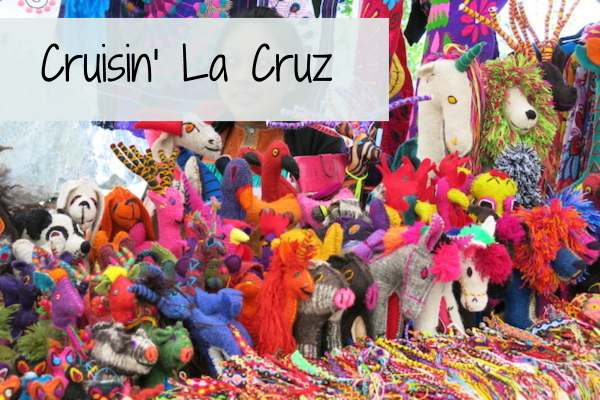 Every Mexican town has a market on a given day of the week, in La Cruz that day is Wednesday. If you need anything from an alarm clock to underwear, check at the market. 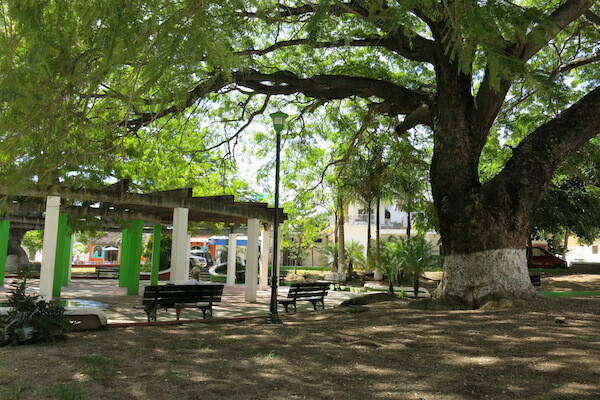 Huanacaxtle tree in the plaza. As your walk toward the water continues you'll pass the Plaza on your right, a colorful and shady respite where you can sit under the sun dappled canopy of huanacaxtle trees and watch the world walk right by. Across from the Plaza is La Ballena Blanca. That whole little block from The Green Tomato to The White Whale (Ballena Blanca) is a series of restaurants run by members of the same family. From an early breakfast to late night music and dancing, someone in the family has you covered. Walk through the Plaza to one our favorite afternoon lunch and drinks places. 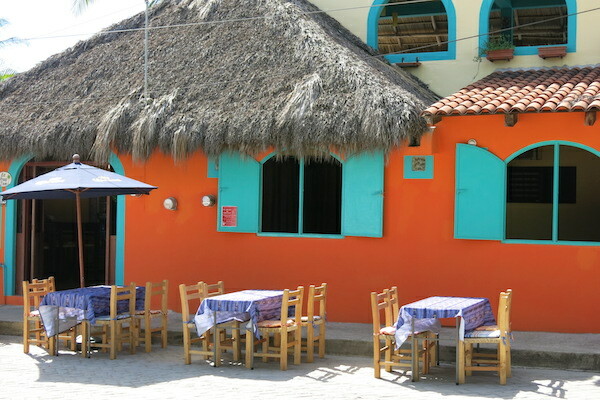 La Cruz Inn serves a variety of Mexican and Gringo type fare and frosty drinks just the way you like them. Continue past the Plaza and you'll find yourself at the marina entrance. There are a lot of events held at the marina the most popular of which is the Sunday Market. 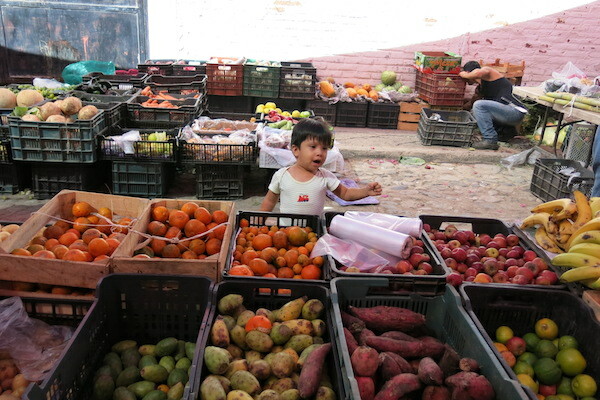 It's referred to as the Farmer's Market, the Organic Market and the Sunday Market but officially it's called Mercado Huanacaxtle. Beginning the first Sunday in November, this spectacular venue features organically grown produce and locally made crafts, gifts, clothing and food. This is a more high end market with a waiting list for vendors to get a table. Live music and great food offerings create a fiesta like atmosphere. 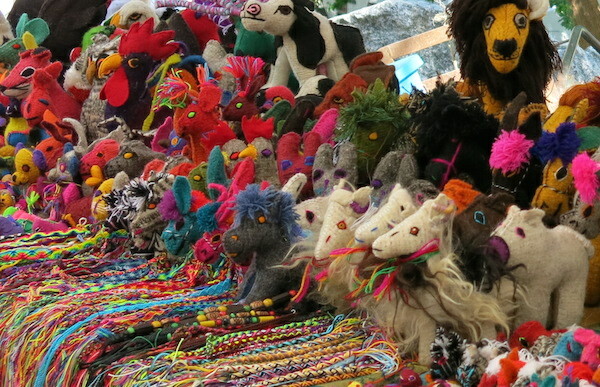 Hand made jewelry, clothing, toys, lotions, candy, food - the handiwork is exquisite and the best that Nayarit has to offer. Bring your appetite and go all the way out to the end of the jetty to find some great eats. The market runs from 10am - 2pm on Sundays between November and April (inclusive). The two things you need to consider when packing for a stay at La Cruz de Huanacaxtle are the weather and the laid back vibe. Even the most formal venues and events have a relaxed atmosphere and glittery flip flops are more common than spike heels (safer, too). Leave the expensive jewelry at home and opt for fun and funky accessories. It's a beach town so the guys wear an assortment of T shirts, shorts, pants and bright cotton button-down-the-front shirts and the women don shorts, T's and sundresses. Footwear runs to flip flops and sandals and the occasional tennis type shoe. Generally there are about 12 hours of daylight each day from approximately 7am to 7pm (0700hrs to 1500hrs). Cotton, bamboo and hemp are my favorite fabrics by a long shot for this climate. Choose light colors for the day and save the darks for night. Check out our complete travel packing list here. Bring cash, there are no banks although you can find an ATM machine at the marina. Expect to pay around 22 pesos for a beer, 60 to 100 pesos for breakfast and between 100 and 250 pesos each for a nice supper. The best tacos right in town are "Tacos in the Street" with the red chairs but an excursion to "Junior's Tacos" up on the highway will ruin you for any others. The streets are mostly cobbled so bring appropriate footwear. You'll be out at night here, everyone is. It's as safe as anywhere and more than most. At night a vibrant hum resonates around town. Strains of music and fragments of laughter escape the open doorways as you pass. 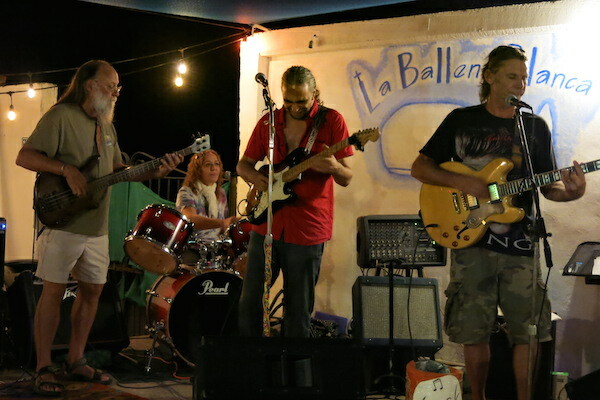 Tatawari, The Shuffle Band, Coyotes, The Deep River Band, Latcho and Andrea are just a few of the very worthy groups that play regularly and The Breeze will get everyone on their feet with their performances on Friday nights at La Ballena Blanca (across the street from the marina entrance). 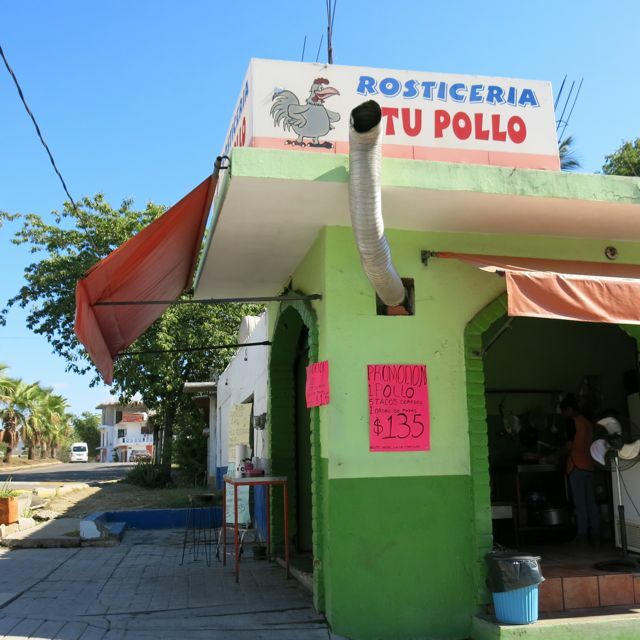 Chickens and roosters are a common sight everywhere in Mexico and this little pueblo is no exception. 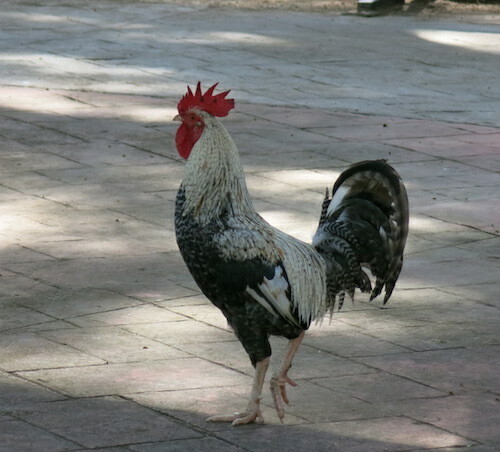 If you'd like to hear a real live rooster early in the mornings, well, you're probably in luck. If you'd rather not hear them ... bring ear plugs. For the most part between November and May the weather is summer like. Daytime temperatures can soar to over 40 degrees Celsius (100F) and feel hotter with a pressing humidity. On the other hand I just looked at a picture of a friend wearing his wool sweater in La Cruz yesterday (Jan. 17th, 2017). The Northers are blowing right now and bringing chilly temperatures and dryer air which can make a sweater necessary especially in January and February (I love the cool weather, don't tell anyone). Although people will tell you that it never rains in the winter, that isn't entirely true, it can pour rain for 2 or 3 days at a time if a "pineapple express" weather system blows through and get chilly enough to send you looking for a jacket or blanket. But, in general the weather is gorgeous, pack for sunshine!